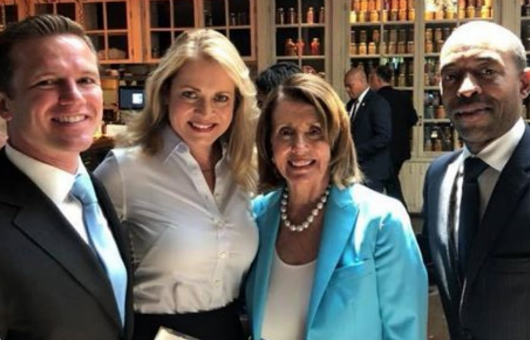 House Minority Leader Nancy Pelosi (D., Calif.) was spotted in the company of some less than savory characters while attending a fundraiser for the Democratic Congressional Campaign Committee (DCCC) in Philadelphia on Tuesday. 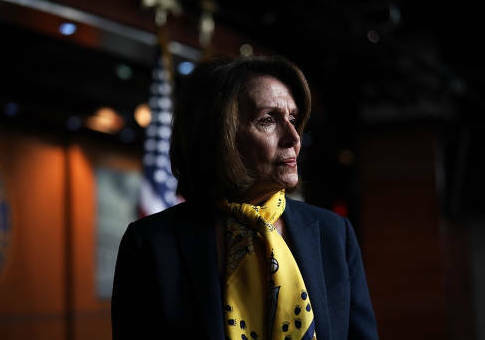 Pelosi, who journeyed to the city of brotherly love to raise money for Democratic efforts to retake the majority in the House, attended a fundraiser with William Miller, a political consultant who pleaded guilty to tax evasion in April, and officials from a labor union under FBI investigation, the Philadelphia Inquirer reported Friday. A photo taken at the event shows a smiling Pelosi flanked by Miller; Jack O'Neil, legal counsel for the United Brotherhood of Electrical Workers Local 98; and Marita Crawford, the union's political director. While the photo shows everyone smiling, it is unclear whether Pelosi has any connections to the individuals or knew of the controversy swirling around Miller and the union at the time of the fundraiser. In April, Miller, a top Pennsylvania political operative with ties to jailed former Philadelphia District Attorney Seth Williams, pleaded guilty to a felony tax evasion charge. Williams, once Philadelphia's top law enforcement officer, was forced to resign his position in June 2017 after pleading guilty to accepting tens of thousands of dollars in bribes and defrauding a nursing home, among other crimes. Miller first came to the attention of federal authorities while the Department of Justice was conducting its investigation into Williams. Authorities began probing Miller's finances because of suspected wrongdoing and said they uncovered the operative had failed to file income tax returns from as far back as 2010. The discovery, which spawned an official investigation by the Internal Revenue Service, forced Miller to cover his tracks by filing false tax returns concealing his income between 2010 and 2014. The filings were made in March 2016. Authorities said Miller attempted to evade taxes on $393, 359 in personal income, resulting in a loss of $94,233 in unpaid taxes to the IRS from 2010 to 2014. Miller, who is set to be sentenced in August, faces a maximum penalty of up to five years in prison and a fine of $250,000. Local 98 has been under federal investigation since at least 2016, when the FBI raided the union's offices. The union and its leadership are being investigated for several offenses, including "embezzlement, attempted extortion of contractors, mail and wire fraud, tax evasion, and honest services fraud by public officials," according to the Inquirer. This entry was posted in Politics and tagged DCCC, House Democrats, House of Representatives, Nancy Pelosi, Pennsylvania, Unions. Bookmark the permalink.